Hello! How are you? I’m a busy lil Monican. 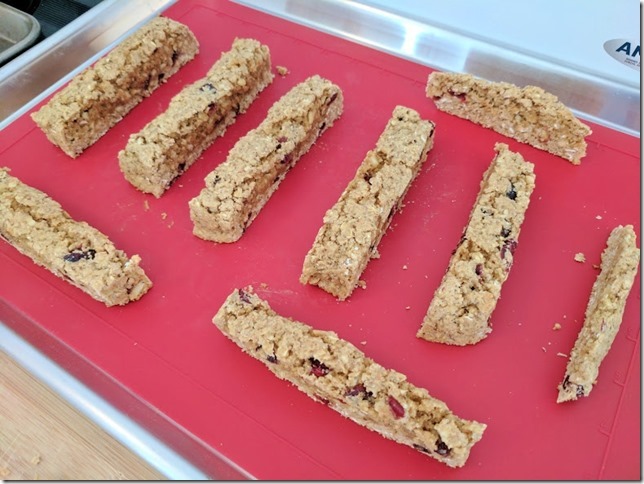 Luckily – I did some meal prep yesterday so I’m not adding to my “To Do’ list with cooking. Plus I got two new kitchen thingys (technical term) that are helping me out. 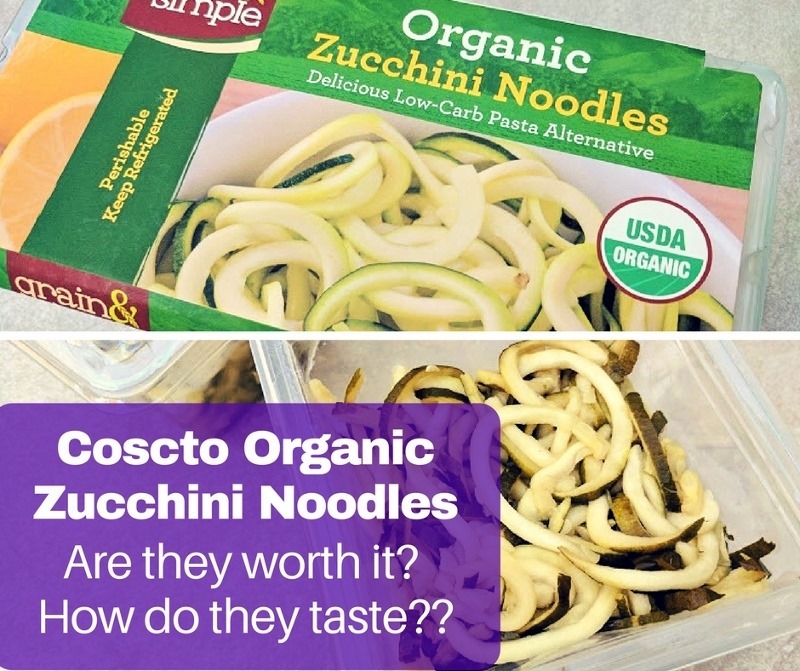 And Costco’s new Organic Zucchini Noodles helped me through together a super quick lunch! But are they worth it? Veggie Noodles and Rice is all the rage right now. You’ve probably heard about Cauliflower Rice… and making recipes from Cauliflower Rice like Cauliflower Pizza and Cauliflower Fried Rice. 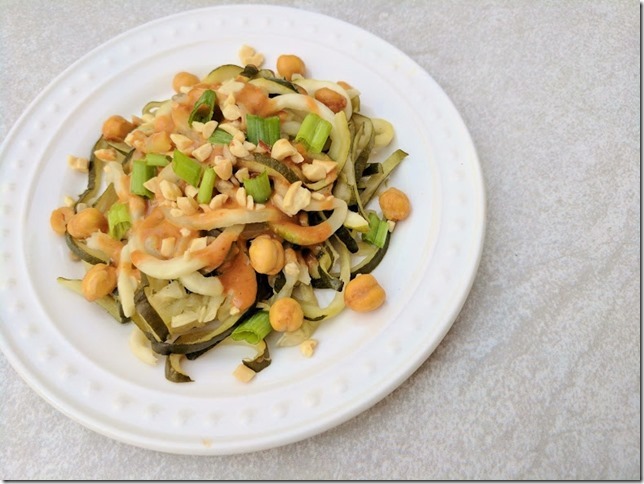 Then, there’s zoodles aka Zucchini Noodles. You can make veggie noodles from a lot of different veggies but zucchini and carrots are the most popular. Now a lot of companies are coming out with pre-made options for these. I tried Trader Joe’s Carrot Noodles and I liked ‘em! I’ve made Cauliflower Pizza Dough and used it as rice. I’ve made zucchini noodles using a Spiralizer. I don’t have a super fancy veggie noodle maker so it took a while to make them. But it was easy. Costco’s been selling Cauliflower Rice for a while. It’s in their refrigerated produce section. 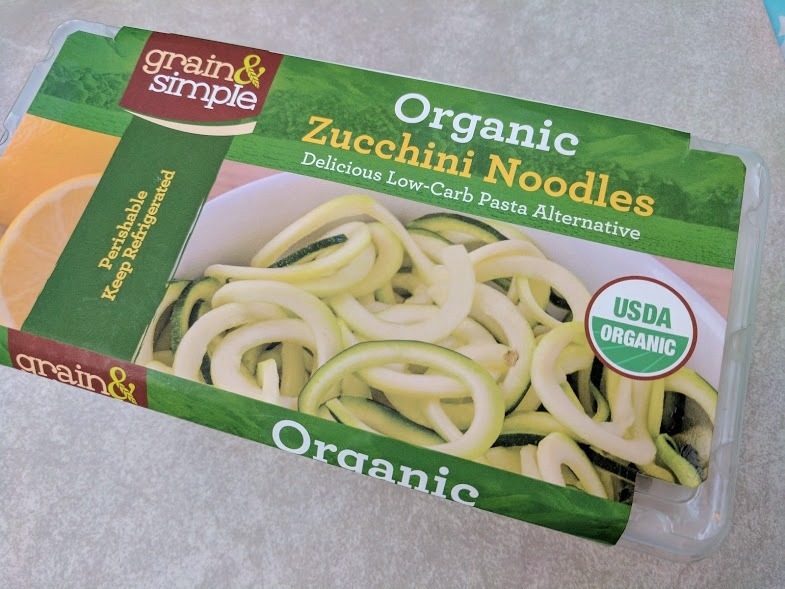 And this week I spotted Organic Zucchini Noodles in their refrigerated section. It was kind of by the prepared / packaged foods like cheeses, heat and eat meats / ravioli and sushi. 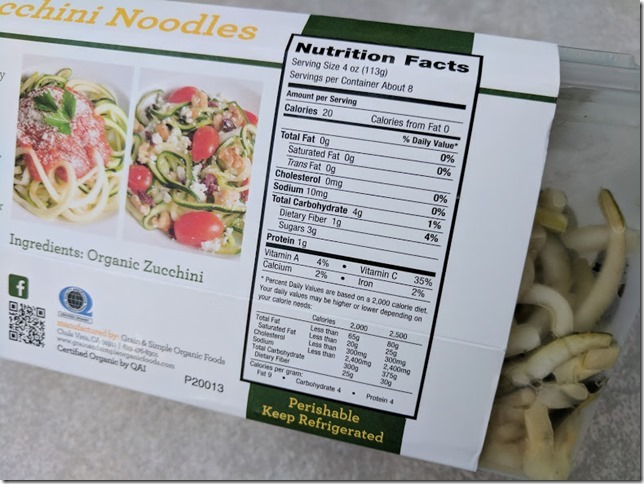 It comes in a pack with 2 containers of organic zucchini. Price. At $9.99 it’s a lot more expensive than buying zucchini and making noodles yourself. 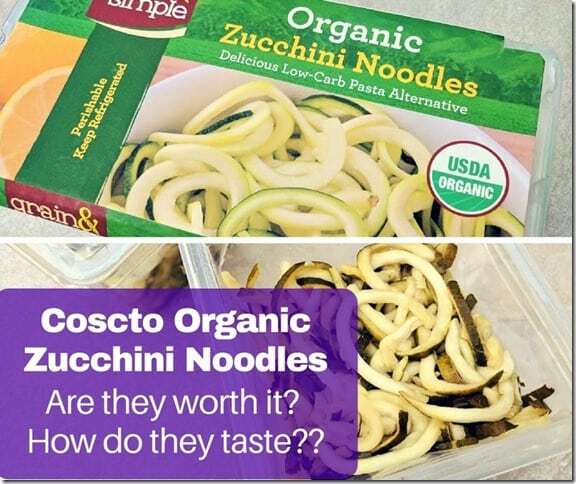 They’re not as fresh as making veggie noodles yourself. The zucchini noodles are a little watery. I think from the zucchini themselves as the ingredients don’t list water added. But this can make them softer and less like ‘real’ noodles. I bought them for RER Research purposes and like them! But I already knew I liked zucchini noodles. And I know how to prepare them in a way that is tasty (to me). I usually make veggie noodles a simple Italian pasta dish with tomato sauce and ground turkey OR with an Asian inspired sauce and chicken. Today I made a simple peanut sauce and kept it vegetarian by adding beans, mushrooms and green onions. It was so good!! Directions: Mix ingredients. Add more Sriracha / stevia / soy sauce as needed. 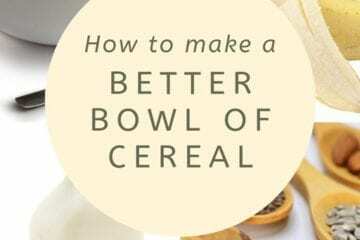 Add water until it is desired consistency. 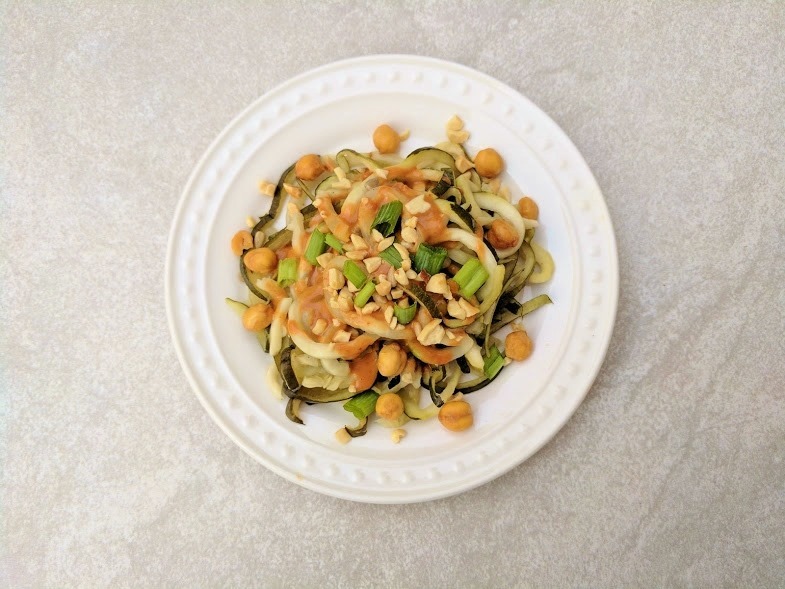 Overall: If you like veggie noodles – consider investing in a Spiralizer or Veggie Noodle Maker. They aren’t that expensive so you will save money over buying ready made noodles like this pretty quickly. I do like the taste and texture of them. And I’d get them again if they fit in my grocery budget. I usually drag a chair to the cabinet when I need to reach something high. 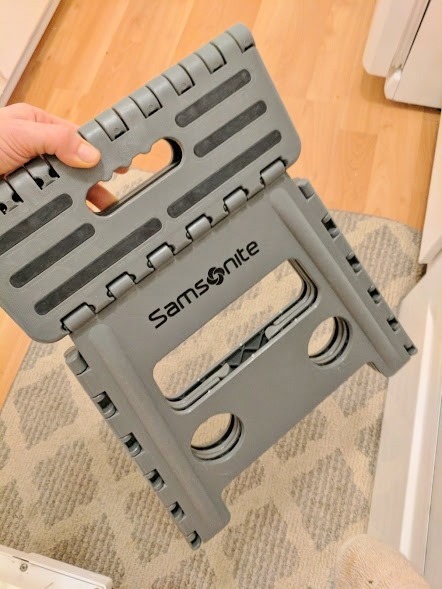 But I realized my chairs were getting dirty AND they’re not super high quality to begin with, so I needed another option. 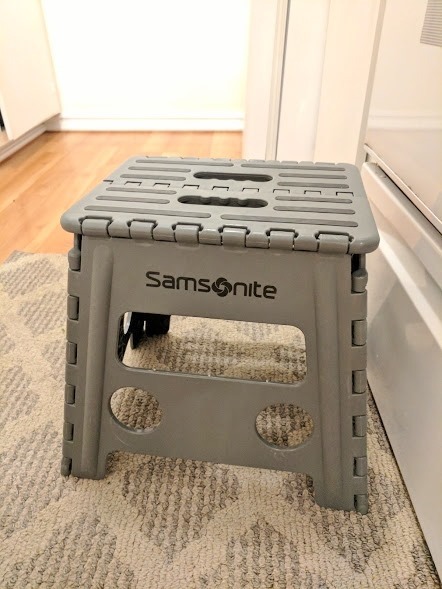 I recently bought this Samsonite small stool. 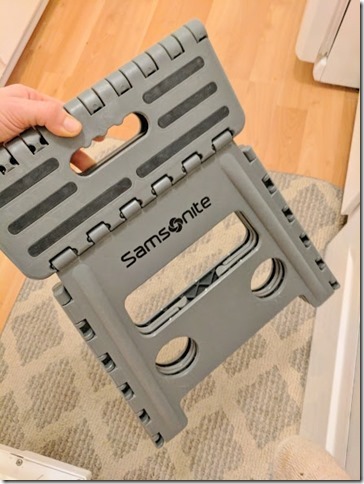 It folds in half for easy storage so I can keep it handy tucked on the side of my fridge. So far I love it and have already used it several times since getting it last week. 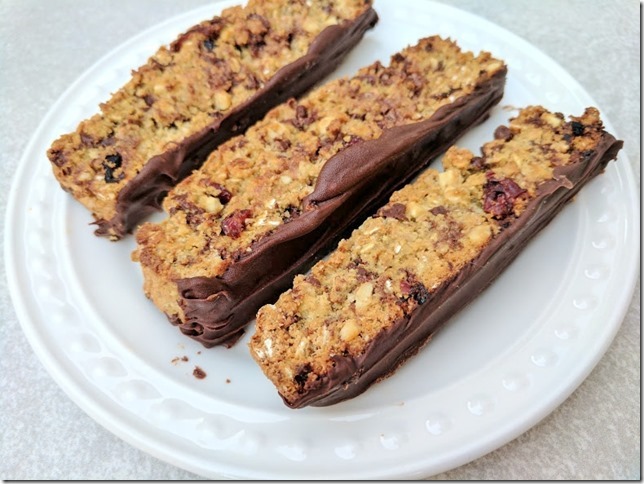 And a friend ripped out a recipe for “Power Biscotti” from their Tennis Magazine to show me. I immediately decided to make biscotti because I’ve never made it before and it’s been something I’ve thought about before. So, yesterday I was a lil baking machine! But when I went out to get all the ingredients I also bought a Silicone Baking Mat. 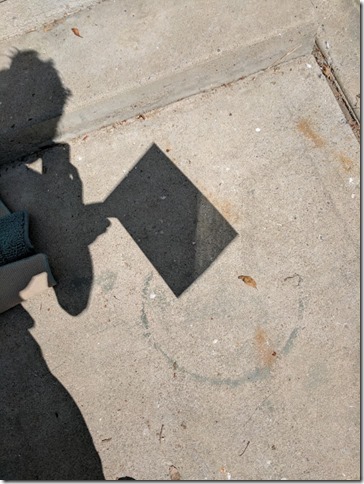 This is something I’ve wanted for a long time and always forget about until I’m trying to scrape cookies or whatever off a baking sheet (while muttering profanities under my breath). I remembered and got a Silicone Baking sheet to use to make the biscotti. 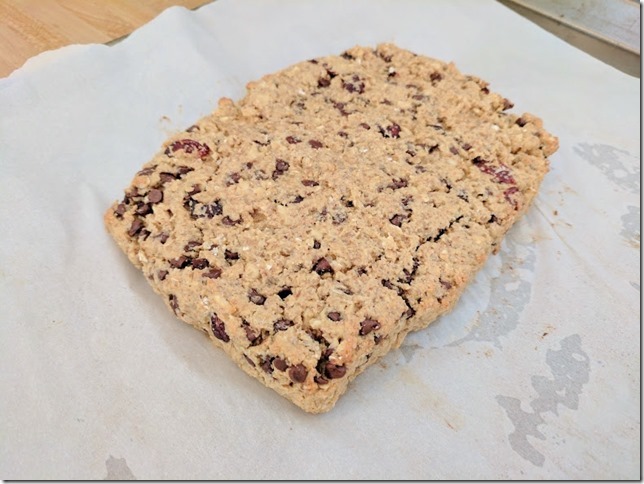 Biscotti doesn’t have any added fat in the batter (at least this one didn’t). That helps it stay crunchy. But I was concerned it would also make it stick to the baking sheet so I’m glad I made sure to add this to my shopping list. Now I’m going to bake all the things!! The biscotti came out delicious! I mostly stuck to the recipe. But I added chocolate chips to half the batch and then dipped that half in melted chocolate for a grand finale! 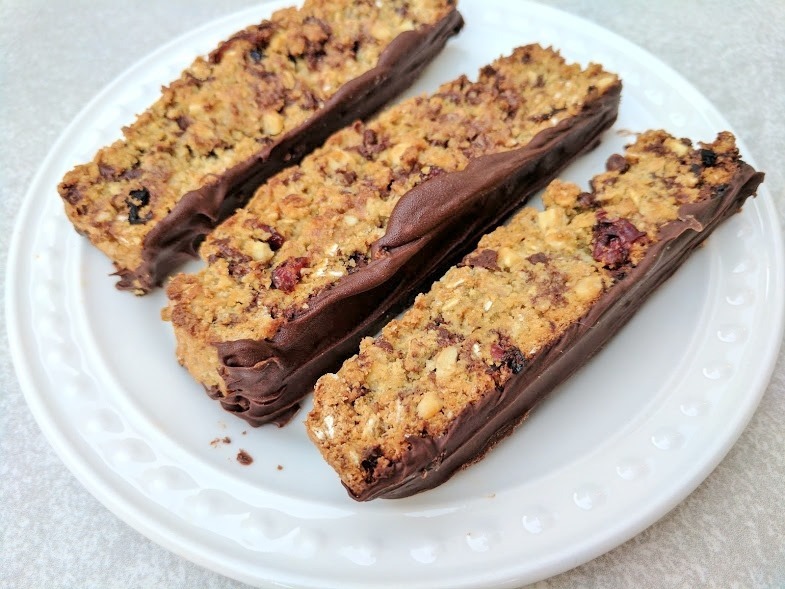 Ya know what goes great with biscotti? And ya know what goes great with coffee? Okay I made that up. 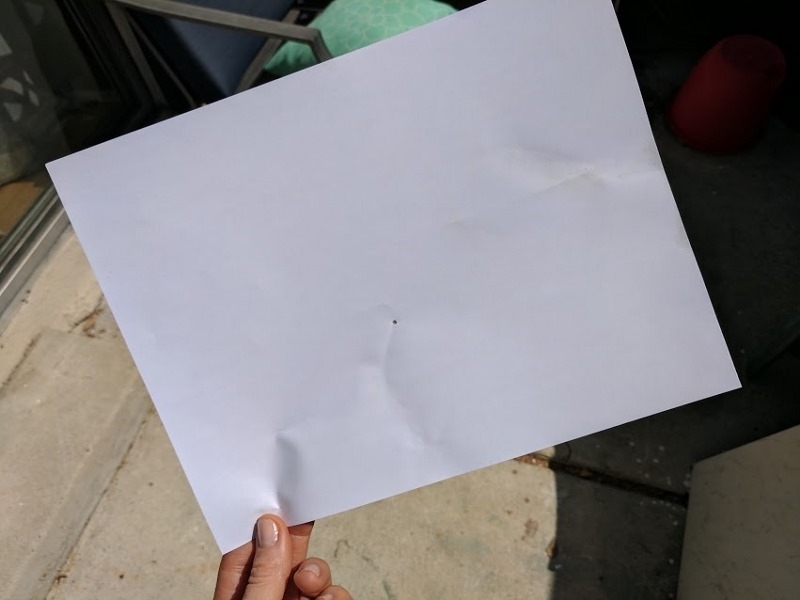 But I did get to see the partial eclipse that passed over Orange County today!!! I used a piece of paper with a hole poked in it to see the moon’s shadow on the ground. It was pretty cool. 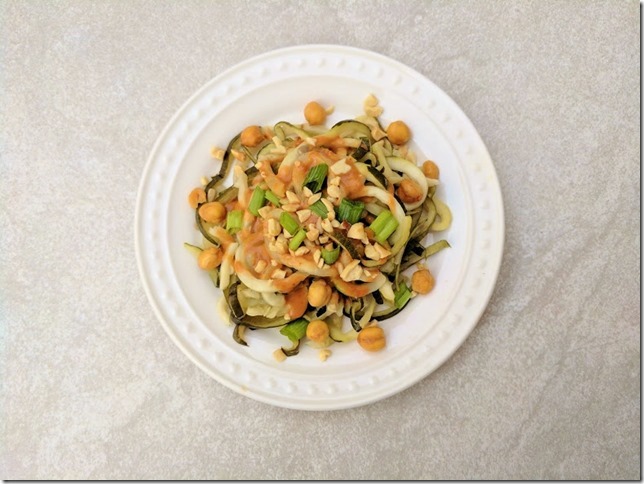 Question: Do you have a spiralizer (or similar)?? What’s your latest kitchen gadget? Do I need it? Did you see the eclipse?? Where? How was it?? I like zucchini noodles. I used to make a Gorgonzola Cream Sauce to go over them, but then that kind of defeated the “healthy” option, I guess, right ?! Still, I may need to try them again with marinara. When I was in London, I used to buy prepacked spiralized zucchini just because it was quicker and I didn’t have a spiralizer. 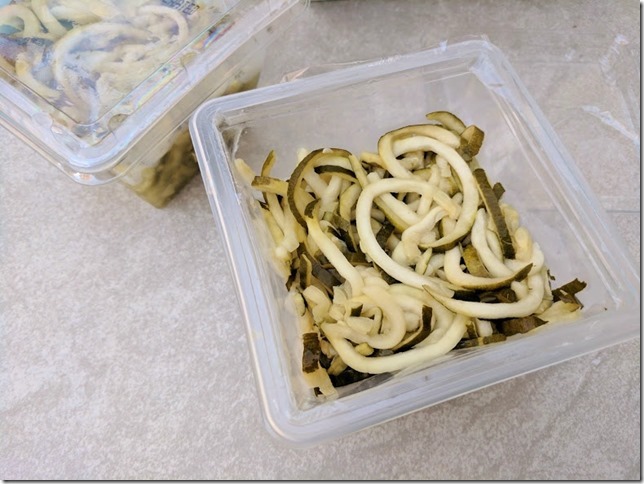 But now that I’m in Hong Kong and they DON’T sell prepacked zucchini… well it’s much cheaper to spiralize them myself! I do miss the convenience of just grabbing a pack of premade stuff though!